Should your business switch to flash storage now? With high capacities and lower prices, is the future all about flash? 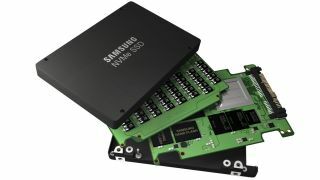 Flash storage as a replacement for traditional hard drives has been touted as the next great hardware advance for the last few years. When techradar pro spoke with Vaughn Stewart, VP, enterprise architect at Pure Storage, he said: "Flash is a massively disruptive technology. Enterprise storage vendors that are still reliant today on hard disks for performance storage are in a position eerily similar to that of Kodak a decade ago: confronted with a new technology that can dramatically undercut their current products and disrupt their business model." Of course outside of the data centre where flash storage is likely to make its presence felt most acutely, does flash have the same potential to disrupt how businesses buy storage capacity for their enterprises? All businesses have experience of this technology – the smartphones and tablets that have proliferated and many thin form factor notebook PCs make use of flash or SSD (Sold State Drive) storage. Tom O'Neill, chief technology officer for Kaminario in EMEA commented: "When it comes to SSD storage suitability, it really depends on the business. Flash presents an excellent business case for any organisation where speed of data access adds business value. Good examples of these include Software-as-a-Service (SaaS) providers and online businesses, or any other business model where users have to wait on information being read or written. "For these businesses, flash can provide a real competitive advantage in the digital marketplace where customers can switch providers near instantly if they are not satisfied with service levels." Smaller enterprises moving away from traditional storage technologies may begin with portable media. At CES this year Samsung showed what it claims to be the world's smallest portable SSD. The T3 has configurations starting at 250GB running up to 2TB and weighs just 51 grams. The 1TB version costs around £300 which is no small investment when a comparable portable hard disk can cost as little as £30.